The medieval donjon (keep) at Loches is everything you want in a ruined castle. Enough of it has survived that there is plenty to climb around in. There's a torture chamber. There are tunnels inside the walls where shooters would be positioned for defense. There's a meticulously tended middle ages garden. The very top of the tour ronde in Loches. Click to crenelate. The taller of the castle's two towers is the actual keep, but it's just the shell. All the innards (floors and stairs) are long gone. It's the older part of the castle, built in the eleventh century. You can still climb to the top, however, thanks to a set of steel stairs (160 steps) that have been installed in recent years. The views from up there are amazing. This photo is of la tour ronde (the round tower), the shorter of the two. It's amazingly intact and you can climb all the way to the top, visiting its various rooms along the way. Each room has a little exhibit about something related to the castle's history, including a model of what the entire castle probably looked like back in the day. The tower was built in the fifteenth century (newer than the rest of the castle). The tour ronde has a characteristic castle defense feature called machicoulis (machicolations in English). These are comprised of the the stones that look like inverted steps at the top of the wall (called corbels) and the open spaces in between from where defenders could shoot arrows or drop stones (or maybe even boiling oil!) on their attackers. We didn't go up into the keep this time, but we did climb up the 102 steps to the top of the round tower. While up there, we noticed something peculiar. A stiff wind was blowing right up the side of the tower wall and was forced through the open spaces of the machicoulis (they have steel grates on them now to keep your feet from falling through). The wind was pushing little droplets of water up into the air; the droplets hovered on the air current for a few seconds before blowing away. Very cool. We climbed down and wandered around the garden for a bit. Then, as usual, we exited through the gift shop. The royal residence at Loches is also an art gallery. 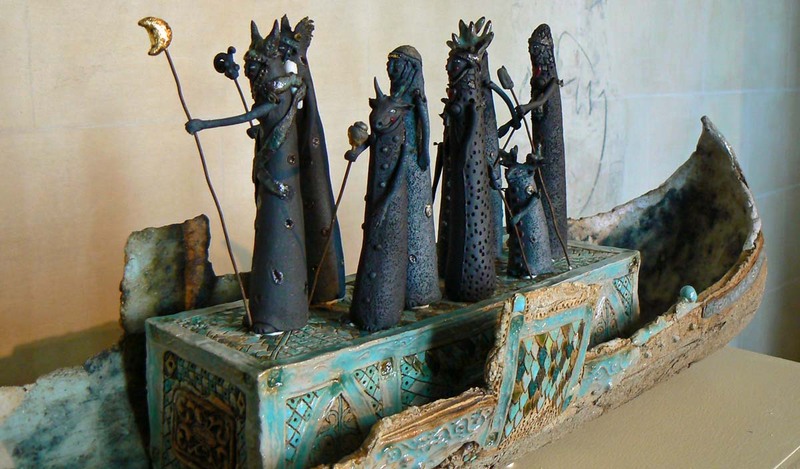 Interspersed with the historical artifacts throughout the château is an ever-changing exhibit of various art works. The current installation is a very contemporary set of mostly abstract pieces. This is one of the less abstract ones that I saw. There's quite a bit of detail on those figurines. Click to artify. It's called "Nave de pèlerins" by Hélène Sellier-Duplessis. Pèlerins means pilgrims, usually of the religious variety. Nave, on the other hand, is tricky. I couldn't find it in any of my usual dictionaries or online. Since these pilgrims are standing in what looks like a boat, I supposed it comes from either navire (ship) or navette (shuttle). I finally looked in the Grand Robert (the unabridged dictionary) and discovered that the word is an archaic literary form of the word navire. Some of the pilgrims look like humans dressed as animals. Others look like actual animals. I have no idea what is going on or what this is meant to evoke. Such is my artistic sensibility. Here's a very different window, seen from inside looking out. This is one of many similar windows in the fourteenth century royal residence at Loches. I have no idea how old these windows are. They could be very old or they could be more modern interpretations of what might have been there before. Who knows? Looking east over the Indre River valley from the royal château in Loches. We're enjoying (or at least not complaining about) the mini heat wave we're having. Although I must say that when it gets over 30ºC (about 86ºF) in the house we're not exactly comfortable. Still, the vegetable garden appreciates the sun and heat, as long as I keep it watered. On Monday, we opted for a salad lunch. Got to keep cool. The laundry is drying very quickly out on the line in this weather. And though it's hot, there is not much humidity. Thank goodness. One of the cool things about the city of Loches (about twenty miles from us) is that from up in the medieval city you can look down over the rest of town. This gives you great views of the rooftops and the hidden courtyards and gardens of the houses below. Things you don't see when you're walking through the streets. This window was partly open to let in the warm summer breeze. 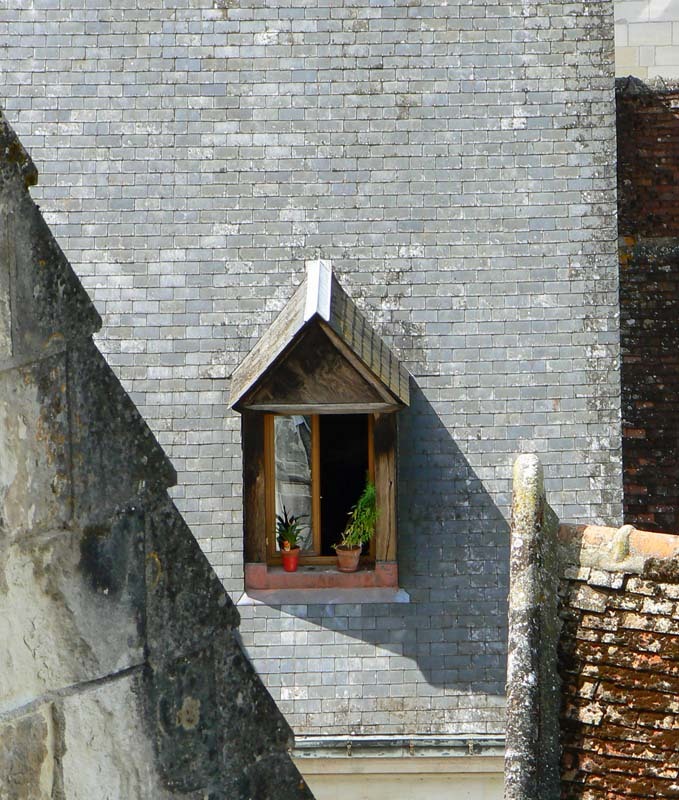 This window looked so nice poking through the various roofs, and the red pot on the sill made it perfect. 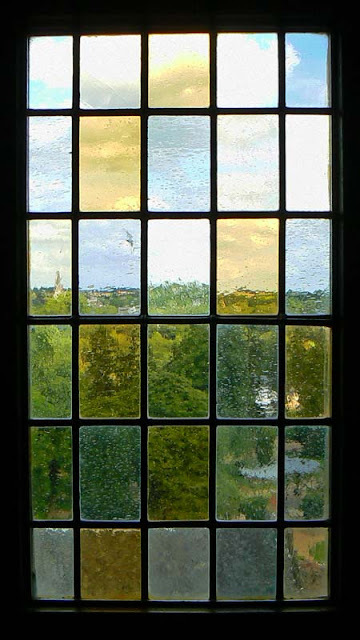 I think I've actually taken a picture of this window in years past; I'll have to look for it. 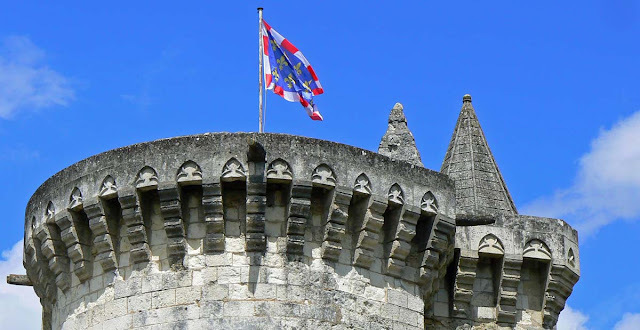 If you're interested in more views of Loches, click on the "loches" tag at the bottom of this post. Then you can scroll through the photos there. It's challenging to take unusual or original photos of such a famous place. I've been here so many times and I still have a hard time getting away from the standard, and beautiful, postcard views of the castle. I have a lot of those. So each time I go I try to find some aspect that I can focus on. Decorative spires on the roofs of the château de Chenonceau. Click to inspire. 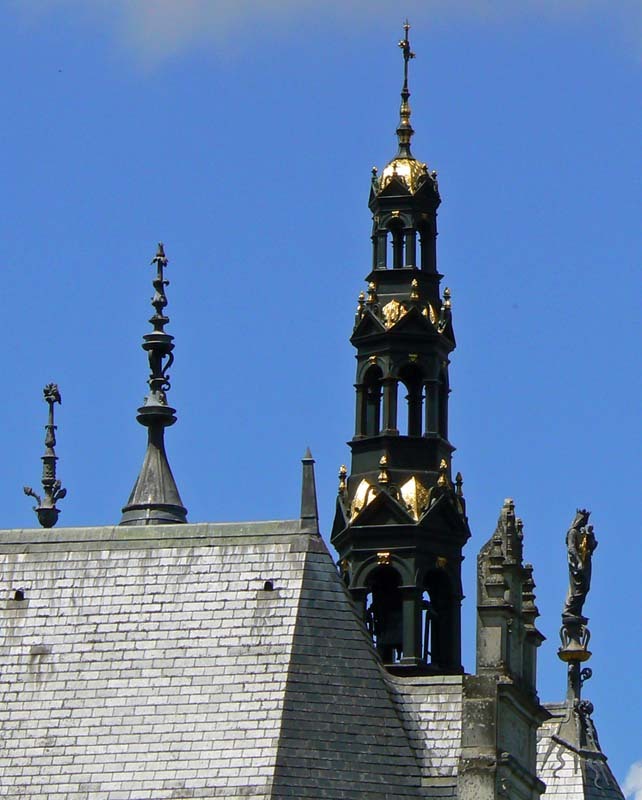 These are the spires on the roof of the main section of the building (not the part that bridges the river). If you didn't already know they are from Chenonceau, you might be hard-pressed to say where they are. I believe that the tallest spire with the gilding rises over the chapel on the northeast corner of the castle. The day we visited, Wednesday, started out as a very rainy day. But by lunchtime the rain stopped, the clouds parted, and it turned into a very pleasant afternoon. The Château de Chenonceau is probably one of the most visited and photographed of the Loire Valley castles, and I've certainly done my share. Its signature gallery spanning the Cher River is recognized around the world. 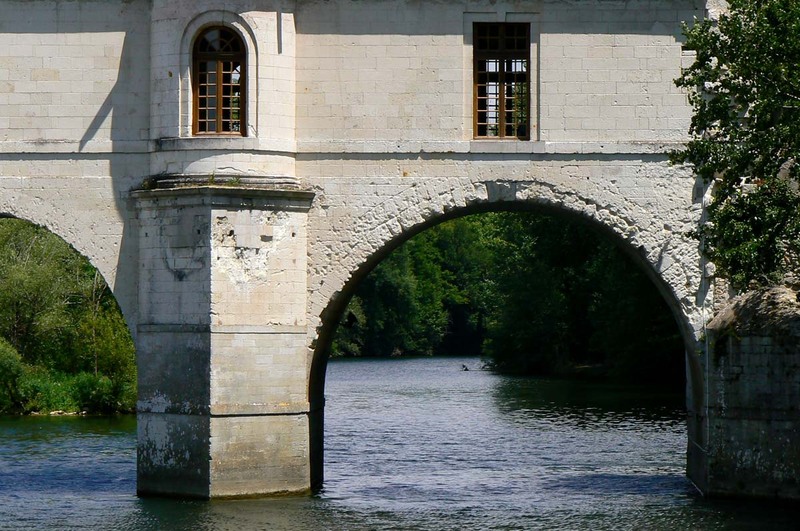 A section of the gallery arches over the Cher River at Chenonceau. If you've been to visit us, or if you've read our blogs for a while, you know that there is a great path along the left bank of the river that passes right next to the castle. The path is public and free and affords great views of the span across the river. Of course, you can't get into the gardens or the building itself; to do that you need to cross the river and buy tickets. The castle is very interesting inside, especially the kitchens that are built down near water level. The grounds and gardens are also very interesting to wander around in. The problem is that in season (most of the spring, summer, and fall) the crowds can really be thick and that can put a damper on your enjoyment of the place. I passed this door while walking in the city of Loches on Wednesday. It's not anything fancy, but the doorknob caught my eye. Someone takes very good care to keep it nicely polished. 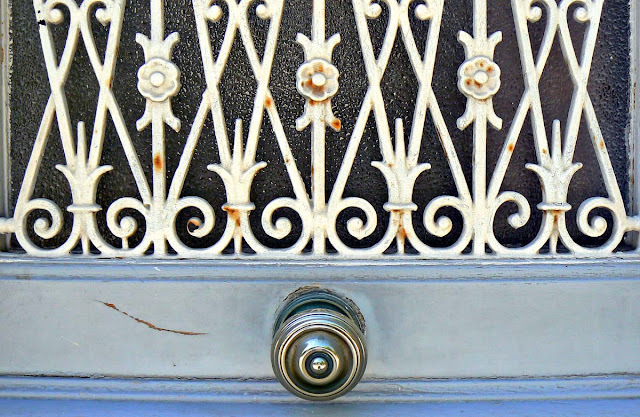 The knob is in the center of the door as opposed to on the right or left. I always wonder what the houses look like inside, behind the doors. And the grill on the window is quite decorative. The door is on a private home halfway between the lower city and historical medieval fortress on the bluff above. We climbed up into the old city and wandered around a bit in the the royal residence (a renaissance building) and the old medieval keep. Loches is a cool small city with plenty to do and see and is well worth a stop on anybody's Loire Valley itinerary. This is a view of the Cher River not far from where we live. It's right at the Château de Chenonceau. We walked along the left bank with our friends from California to look at the castle. The walk is free, but you can't go inside the building or into the gardens that are on the right bank from there. On our way back from the castle to the car, I noticed this guy rowing up river against the current. He looked to be in his fifties or sixties and he was moving right along. He must be in great shape! Our day was full of fun and I'm sure Ken will chronicle it. I have some photos that I'll post over the next few days, along with any new ones I take while the friends are here (until Saturday). We got home from our day out around seven last night and had a dinner of coq au vin and talked and laughed into the wee hours. And I understand a football (soccer) match was watched (online) long after I retired for the night. 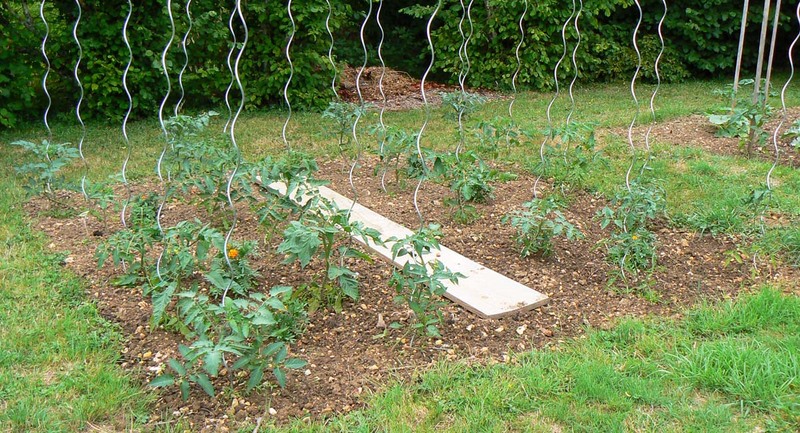 Here's a gratuitous photo one of the four-square garden plots. This one is given over to tomatoes this year (we do our own version of crop rotation - last year it was corn). There are twenty plants. We have eight more tomatoes among the squash plants in the square to the right, and then we have another eight or ten in pots on the south side of the house. The plot is roughly 4 meters (about 13 feet) square. There are 3 more. Click to thicken the plot. Can you see how rocky our soil is? And this is after about seven years of gardening in this spot, removing rocks, adding compost, etc. The soil looks dark because we water it, and this photo was taken soon after a weeding session, so it looks pretty neat. If we didn't water it, that soil would look (and feel) like concrete. There are also a bunch of marigolds in there among the tomatoes. I don't know which varieties are which, but this year we've planted eight kinds of tomato. I love the names: Rutgers, Roma, Brandywine, Sweetie, Juliet, Yellow (how boring), Noire de Crimée, and Fiorentina. Too bad that Callie's eyes are closed. Oh well. The one that is not Callie is a neighborhood dog. His name is Vasco, I think. He lives down the road, toward the river. Every once in a while our paths cross. The two of them get along just fine, and Callie is always the submissive dog. Callie and Vasco on the vineyard road. We're still having cloudy and dry weather. The wind is less than it was, but it's still blowing. I don't think I could stand living down south where the Mistral blows. The constant wind drives me crazy. I just want it to stop. The temperature warmed up as promised, but under gray skies it's not as nice as it could be. I'm weeding and watering. This is one of two sunburst squash plants given to us by a friend this season. It's flowering now and it even has squash on it. It won't be long before we start harvesting. We also have two round zucchinis, also given to us by the same friend. We traded with a couple of potimarron (red kuri squash) plants that I had started. At the base of the left-hand blossom you can see a little yellow sunburst squash. Click to cucurbitate. So that makes six squash plants in the garden. They all have flowers and/or fruit on them in varying stages of development. I also have two cucumber plants coming along in the corn patch. The idea is that the cucumber grows in between the rows of corn, helping to keep the weeds down while providing us with cool cukes. It's flowering now, too. I've got to get out in the garden now and do some weeding (did a little on Sunday). Since I'm watering, the weeds think it's for them and they're coming up all over. The trick is to get 'em while they're young. I'm also pinching suckers off the tomatoes nearly every day. They sure do grow fast. With all the talk of drought around the country and in our region, it's hard to tell at first glance that anything's wrong. Everything looks pretty green. But if you live here, and know how it looks when it's raining normally, you can see the differences and the effect the lack of rain is having. The view across the Cher Valley from up in the vineyards, looking roughly north. For one thing, the fern cover in the forests isn't as dense and high as it normally is. Plants are generally smaller this year than last year. The grass is browner and doesn't need cutting as often. The colza crop has long been harvested and the grains are brown and ready. The sunflower fields are looking pretty sad. In the photo above you can see brown and green fields. Most of the brown are where colza was planted. The green fields are vineyards. I wonder what they'll be saying about this year's wine when it's harvested? 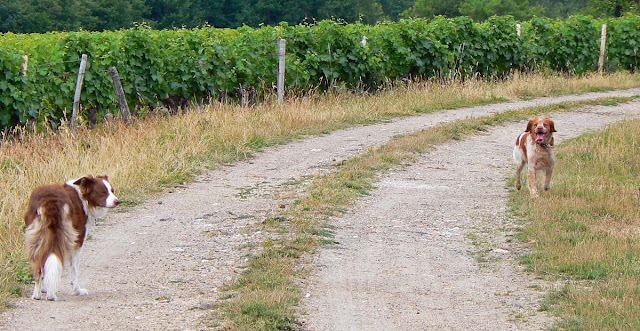 Dry conditions often make for good wine, but the yield will be lower. It could start raining again at any time, but for many crops it will be too late. Even the grape vines have already set their fruit for the season. More or less water will only have an impact on the quality of the juice, not the quantity. I'm getting tired of dry overcast days. There are breaks in the clouds every now and then that remind us of what we're missing: the sun. It's not as bad as I make it sound, but for the past week or so it feels as though the permanent color of the sky is gray. Sometimes it's dark like a well used blackboard that's been freshly erased. Sometimes it's lighter, almost milky. And there has been no rain. Neatly trimmed grape vines under a cloudy sky. Yes, we did have rain a little less than two weeks ago. I measured forty-three millimeters (a bit more than one and a half inches) of rain in the gauge when it was over. And we got a little more yesterday. But our rainfall this spring has been woefully below normal levels and the drought is deepening across France. It was nice in April and May. The sun shone brilliantly and it felt like summer. Spring flowers brightened everything and lifted our spirits up and out of winter. It didn't seem to matter that it wasn't raining, even though we knew that it should have been. But now the mood is different. The news stories remind us daily that farmers are having a difficult time. Crop yields are down and what there is is ready for harvest too early. There's not enough grass to feed the livestock. Water levels in the rivers are down. Necessary irrigation is lowering the water tables even more. And now the sky, like our outlook, has gone from bright and sunny to gray and sullen. Days on end of gray skies without rain is frustrating. There's no compensation that at least the plants are getting some water; they're not. There's no bright sunshine to make it nice to be outside. In fact, it's not all that warm any more. Just dry. And gray. It won't last. The sun will come out (do I hear Broadway music?) at some point. Or it will start raining again. But for now, as the summer solstice approaches, we watch and wait under the cool gray roof that nature has pulled over our heads. There is a pond outside our back gate. It's a small pond, man-made, and ostensibly serves as a reserve in case of fire. In this time of drought, the pond is slowly evaporating. This happened a number of years ago during a similar long dry spell. The town reacted by trucking water up from the river to replenish the pond. With the river water came an invasive weed that takes over and chokes the pond. But it has pretty yellow flowers. Here's Bertie walking around the pond. Callie heard him meowing, but hadn't seen him yet. This weed is everywhere in our region. It's called jussie or ludwigia, and we saw something about it on television recently. In a nearby wildlife preserve, one of the big ponds (or lakes) was choking with this weed. The authorities drained the pond completely (saving the fish by moving them to a new home) and burned the weed out. This process took nearly a whole season. I'm sure that our town will not be doing this with our pond. 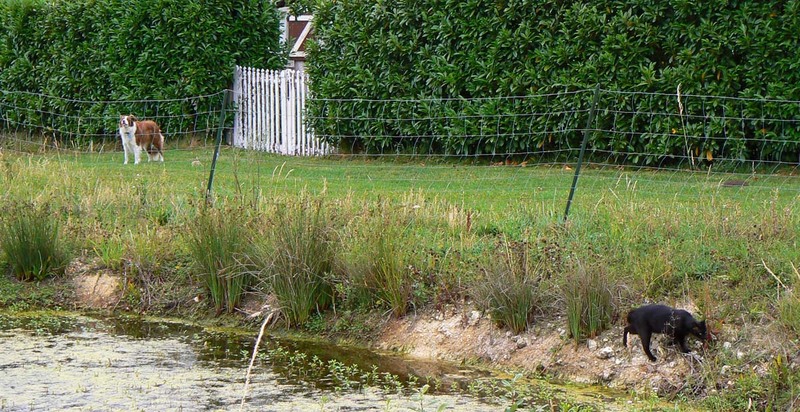 The weed dies back in winter, but flourishes in summer, nearly covering the whole of the water's surface. Still, our little pond is full of life. It is home to frogs and fish. I've actually seen people fishing the pond, although what they catch is little more than bait-sized. On Thursday morning, while returning from my walk with Callie, I noticed Bertie at water's edge. I wonder if he was fishing? Callie usually goes around the pond to the north through the grape vines, while I stay on the dirt road to the south; she waits for me at our back gate. Bertie saw me and started to come toward me. Callie stood by the gate and watched. Bert was meowing and came through the wire fence so that I could pet him. Callie didn't move. That really surprised me because she usually wants to chase the cat. Maybe it was because I was petting him and that calmed her down a bit. Just before Bertie got to where I was, I was able to get the camera turned on and snap this picture. These berries grow on a plant whose multi-pointed leaves resemble holly. But, as far as I can tell, the holly that grows in Europe (ilex aquifolium) has red berries much like its counterpart in the Americas. As you can see, these berries are blue. So I'm stumped. Our mystery berries. Do you know what they are? This plant grows inside one particular section our bay hedge out by the back gate. The green leaves you see in the photo belong to the hedge, not the "holly." I should go take a photo of the pointy leaves, but I'm lazy. The fruit resembles blueberries, except that they're much smaller and don't have the blueberry's characteristic crown on the end. Besides, blueberries wouldn't grow in dry clay soil, I don't think. In any event, I'm not eating them. UPDATE: So I think the commenters are correct. This seems to be mahonia. And the berries are edible, once cooked. There aren't enough for me to bother with, so I won't. I suspect some bird ate the fruit of this ornamental plant somewhere in our area (apparently birds love these berries) and "deposited" the seeds here under our hedge. This year's kitchen window flowers are kind of a blue/light purple. They're surfinia petunias and we've been planting this variety in the window box for several years now. We like the way they tumble over and they make a nice contrast with the red geraniums on the deck. Aren't these a great color? These are just beginning to grow over the edge of the window boxes. In the next couple of months they'll cascade down a couple of feet giving us a nice show of flowers on the front of the house. We got them at a nursery in Saint-Aignan. We met the owner a few years ago at a party (but didn't realize he was the owner of the nursery then). He recognized us last month when we bought the plants. Then he told us that he is retiring and just sold the nursery to a younger guy, and introduced us (sort of). It's good to know that the nursery will not be closing any time soon. They do a great job with spring plants and I'd rather give the local folks our business than have to buy plants from a big chain. And they're much closer than the Thursday market in Selles-sur-Cher where we had been buying flowering plants. The walnut tree out in the vineyard is doing its thing. It looks like it might be another good year for walnuts. We still have some in the pantry from last year thanks to our friends a couple of towns over. They have a good sized tree on their property and had an abundance of nuts last year. A walnut. The familiar shell is inside this protective husk, much like a chestnut but without the spikes. Later in the fall I'll start gathering them from the vineyard tree as they fall. They're small, but when they're good, they're very good. The vines are looking good! I'm hopeful that we have not seen the last of summer. Especially since summer hasn't officially started yet. Spring was warm, and now we're in a less-than-warm spell. But the warm weather should come back. If it doesn't, our garden is done for. A cold, wet summer, like the one we had in 2007, will simply destroy the vegetables. * Sometimes I write these things ahead of time, so I have to adjust when it posts. Callie and I left the house this morning around 6:30 for our walk. The sun was up and there was no wind at all. As soon as I stepped outside I heard the familiar whoosh of a hot-air balloon's propane burner. So did Callie. She recognizes that sound and immediately joined the chorus of barking dogs across the neighborhood as the balloon drifted over our yard. This particular balloon is a familiar sight at our house. It must take off reasonably close to us. I'm sure the neighbors enjoy being woken by barking dogs at 6:30 on Sunday morning. But what can you do? All dogs bark at balloons it seems, and summer is balloon season in wine and château country. As soon as I opened the back gate Callie was gone. Running up and down the rows of vines, chasing that damned balloon. The balloon was with us for most of our walk until our road turned away from its path. It finally got far enough away that Callie lost interest. But for most of our walk out to the end of the road, she was up and down the vineyard rows barking at that thing in the sky. She even missed two rabbits that passed right in front of her because she had her eye on the balloon. I wonder if the passengers in the balloons are curious as to why they have to fly over neighborhoods filled with barking dogs? Things are looking up. Well, at least Callie is. I think she was watching the sun behind the clouds. Making sure it wasn't a hot-air balloon. She is sitting beside her tennis ball, which is just visible behind her back. Callie sits out by the real fake well, amusing herself while waiting for "someone" to toss the tennis ball. You can see from this picture how dry the yard is. Even after the forty-three millimeters of rain we had earlier in the week, it will take time and more rain for the grass to recover. The vegetable garden is already dry on the surface. I may have to start up the watering again soon. At least the two water collection barrels are full, so I can use that up before hooking up the sprinkler. Over the past few nights the skies have been clear. That gives us a brilliant star show of which I only catch glimpses when I get up in the middle of the night. The sky is still pretty light when I go to bed around 10:30pm, so I only see the brightest of the stars then. A clear sky overnight usually means cool temperatures in the morning. The colors were subtle but beautiful. Click on the picture to solarify. The sun warms things up eventually, although the days still feel downright chilly compared to the mini heat wave we were enjoying less than a week ago. I've been getting up early this week for various reasons. If I've managed to close Bertie in the night before, he's itching to go outside before the sun rises. He likes to hunt. His movements and meowing downstairs can wake me two flights up. Especially when the dog hears him and she gets agitated. Thursday was one such morning, meaning that I was out of bed before 5:30am feeding the cat, making tea, firing up the computer, etc. I got out the door with Callie just after 6:30 for our walk. The sun had been up for about forty-five minutes already and there was this long horizontal cloud in the eastern sky. At the moment we got to the farthest point of our walk, the cloud moved to block the sun and this is what we saw. A few minutes later the cloud had moved out of the way and we were walking into the warm sunlight. Thank goodness, because it was about 8º out there (about 46ºF). Because apples will fall on your head. This year looks like a big year for apples in our yard. That's a good thing and a bad thing. 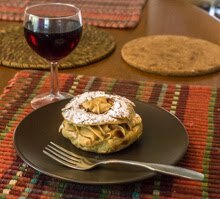 The good part is that there will be lots of apple tarts, apple sauce, and apple jelly (and who knows what else) later in the year. The bad part is that there will be thousands of apples on the ground that will have to be picked up each time I want to cut the grass. 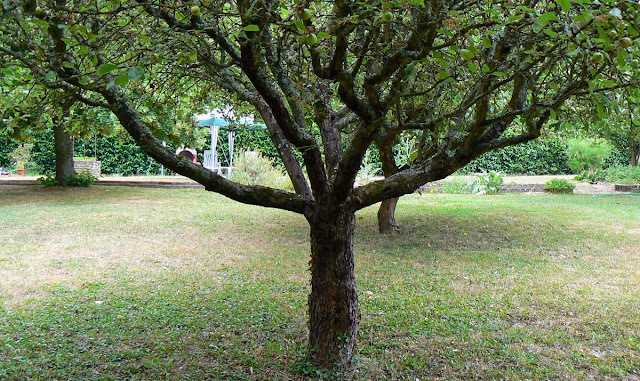 Two of our apple trees. The tree in the upper left of the picture is a tilleul (linden). There already are hundreds of them on the ground, but they're small enough that the mower will just chew them up. When they get bigger, the mower can't handle them and I have to go around filling the wheel barrow a few times before cutting the grass. I dump the apples in the compost piles and by the following year they've turned into soil that goes back into the garden. By the end of the season I'm usually so sick of picking up apples that I just rake and roll them right into the empty garden plots where they can rot over winter, completely bypassing the compost piles (which are already full by then). We have four apple trees in the yard. There was a fifth, but it was dying and I cut it down a few weeks ago. There are two in the photo above. Each produces a different variety of apple and I don't know what they're called. Not pictured is the big daddy apple tree which is just to the right. It drops the most apples by far. Even with all these apples, one of our neighbors has four or five trees outside his fence next to the vineyard that are different from and (in my opinion) better than ours. 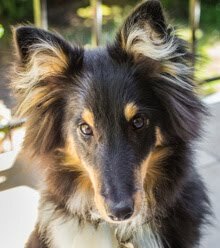 I sneak over during early morning walks with Callie and pinch a few every now and then for pies. Shhhh... don't tell. Our potager (vegetable garden) is what I call a four-square design. That is, it's four plots, each one being a square of four meters by four meters separated by a grass strip one meter wide. That's sixty-four square meters for planting. I based the design on a kitchen garden that I saw at the Château de Fougères-sur-Bièvre, not far from here. In addition to that, we also have a small plot in the back corner of the property that was once a compost pile. That spot is about one meter by two. Ken has a collard greens patch back there this year. But a few years ago, we decided that we needed a bit more space, so Ken tilled up a strip along side the four-square plots. The strip is the width of the rototiller and nine meters long. Originally, we grew the overflow tomatoes in it. This season, as you can see on the left, I've got lettuces, chard, and leeks planted there. Our soil is mostly clay with lots of rocks and the strip seems to have more than its fair share of rocks close to the surface. We've started to dig out the top layer of rocks and are replacing it with some good bagged soil. I'll be interested to see how that tills in next spring. We've recently decided that we should invest in a chipper/mulcher for the garden. We have more yard waste each year than our three compost piles can handle. Most of it is the result of the annual trimming of the bay hedge. We try to burn it each year, but that means piling it up somewhere to dry then covering it until we're ready to burn. It's a pain. We figure that a chipper will help to reduce the trimmed branches to a more reasonable mulch that we can spread on the garden plots to keep the weeds down over winter. Then, in spring, we can just till it into the garden soil. Excess mulch will easily go into the compost piles (along with the tons of apples that fall in the yard every year). 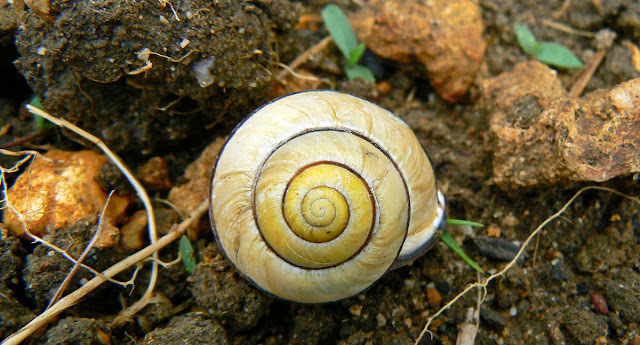 And that something is a gastropod (from the Ancient Greek, gastro for stomach and pod for foot). Alas, this poor fellow is just a shell of his former self. The snail that inhabited this particular shell is long gone, perhaps drowned in garlicky butter. Or not. That's not an "eating" snail. Those green things on the right side of the shell look like antennae, but they're just tiny blades of grass. We see this variety fairly often in the vegetable garden and around the exterior of the house. If I'm not mistaken (and considering my minimalist research I very well could be), this is an escargot des bois, or a grove snail in English (cepaea nemoralis). 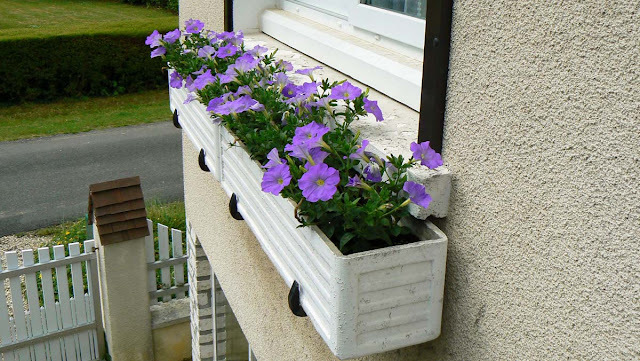 It normally feeds on dead or dying vegetation, so it poses no real threat to our garden. The shell, which I understand is quite variable in color, is often a creamy yellow like the one in the picture above. At least, that's the color that I notice most in our garden. When I took the garbage out this morning, I noticed this guy near the driveway. 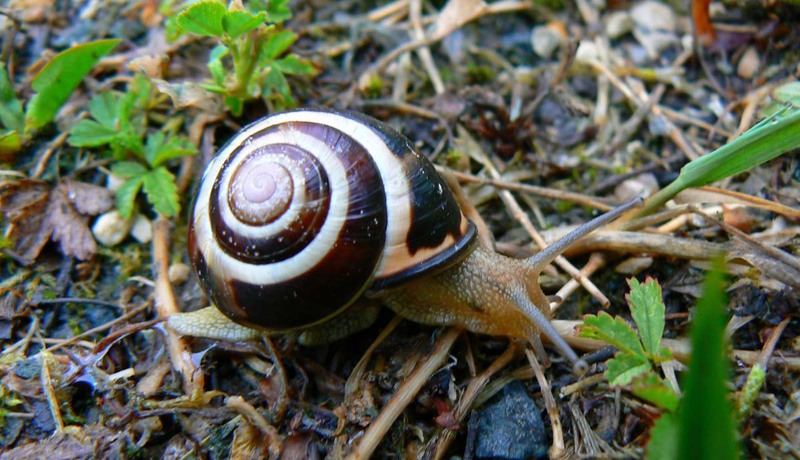 I think it's the same variety of snail, but with wider banding on its shell. And look at those eye stalks! If anyone who knows better can confirm or correct my identification, I welcome your help! 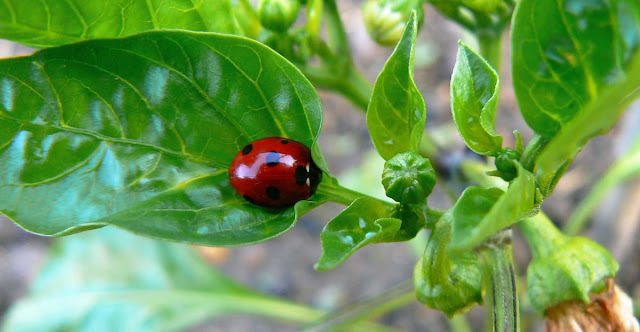 I saw this ladybug on the bell pepper plants a day or so ago. It seems it was sleeping in the folds of a leaf. Do ladybugs sleep? At any rate, it wasn't moving when I took the picture. Ladybugs are good for the garden and I like seeing them out there. We're still in the throes of this drought. There were promising thunderclouds on Saturday afternoon and Sunday was an overcast day, but very little water tumbled out of the sky. I'm trying to be good about watering the garden. The water that we use to wash vegetables and lettuce gets saved and it goes to water the flowers in the window boxes and the house plants. The little rain we do get runs off the roofs of the house and garden shed into collection bins for use in the garden. We try to minimize the amount of tap water we use for plants, but it ain't easy with these dry days. I imagine that if and when it starts raining again, I'll be complaining about the lack of sun. ***** UPDATE: I wrote this post on Sunday morning. On Sunday evening, during the French Open final, we had a good thunderstorm. When I checked the rain gauge, we had 26mm of rain. Wow! That's just over an inch in a few hours. I went to the St.-Aignan market on Saturday morning just after Ken left for his trip up north. The day was sunny and warm and the market square was buzzing with people shopping for the weekend. I made the rounds looking at all the good stuff, but I was really after some strawberries. They guy from whom I buy asparagus every year also sells strawberries. His son (or is it is son-in-law?) grows them not far from here. 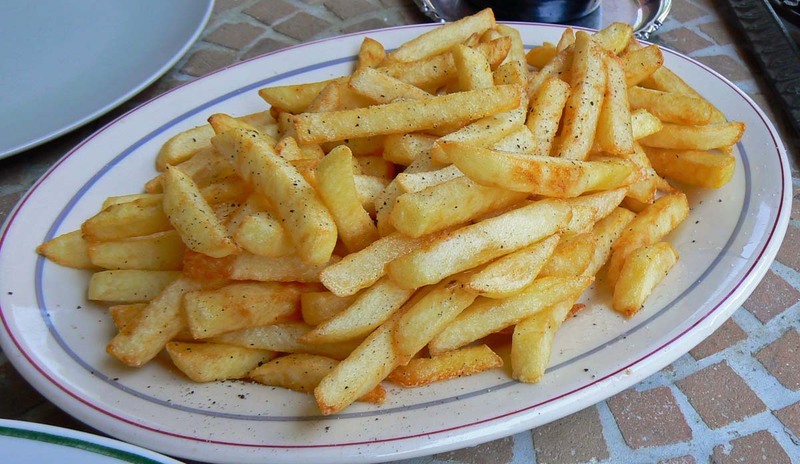 A plate full of fries. I like them with salt and pepper. After I scored the berries, I stopped by the poultry vendors for something to grill for lunch. They had some nice looking sausages (the long thin kind called chipolatas) made with chicken and herbs. I got two of those. I also couldn't resist a couple of duck sausages. Then I saw that they had some made with rabbit; I took two of those, too. I grilled one chicken and one rabbit sausage and made this batch of frites (fries). Very tasty with some hot Dijon mustard. I followed that with a salad of frisée from the garden. Dessert was, naturally, fresh strawberries in a little port wine. I sat out on the deck and enjoyed a leisurely lunch while tennis was on the tv inside. The rabbit sausage was good. It had a richer and very slightly gamey flavor compared to the chicken sausage. By the way, the strawberries are of a variety called Charlotte. It's an ever-bearing variety and the fruit is a little more hardy than the gariguette or the extremely fragile mara des bois varieties that we also get this time of year. This is one of the lima beans that's currently sprouting in the vegetable garden. I planted two rows and am hopeful that they will all come up and produce a decent little crop. The last time I tried limas was a bit less than successful. Some years are good for beans, some aren't. A lima bean plant just sprouting. Click to leguminate. The corn is doing well; most of the seeds came up so I'll have to thin them out as they get bigger. And it looks like all the other seedlings have transplanted well. The tomatoes, eggplant, and squash plants are putting out new leaves that look healthy and green. There are even some blossoms on the squash and the bell peppers. I was doing a bit of weeding in the tomato plot on Thursday and I accidentally cut one of the tomatoes off at the ground. Oops. Luckily there are still four more seedlings that haven't gone into the garden, so I was able to replace the severed 'mater right away. No harm done to the crop. It's good to have some back-up. Of course, with forty-seven tomato seedlings, it's hard not to have some back up. Country roads. This one is roughly parallel to ours and joins up with the dirt road that runs from our house out through the vineyard. It's typical of the little roads that criss-cross the countryside all around us. The towns keep the shoulders well mowed; if they didn't, there would be nowhere to pull over when you meet another car or a tractor going in the opposite direction. Wild grasses fill up a field next to the vineyard parcels (which you can't see here). This view just screams summer to me, even though it's still spring. The plants and wildflowers are well advanced this year due to the early warm weather. The drought is accelerating their growth cycle even more. I heard on the news that grain harvests are starting already, about three to four weeks ahead of the normal schedule. And the crop is diminished due to the heat and lack of water. 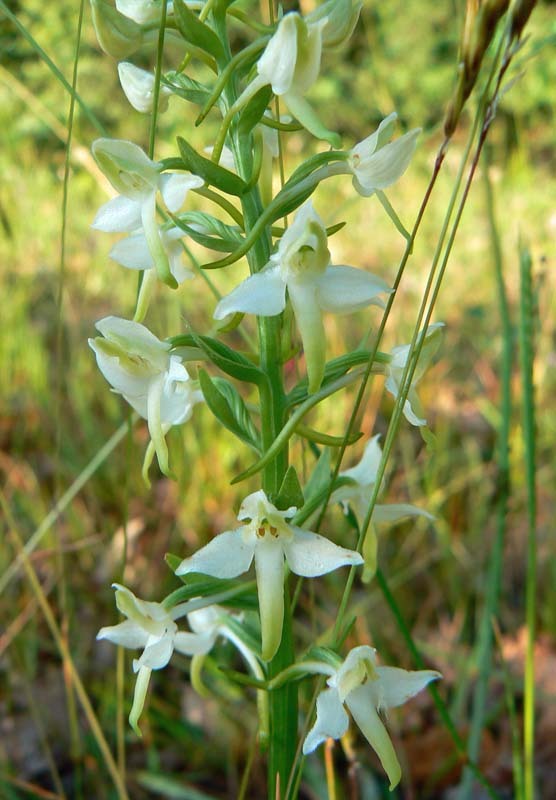 There are several species of wild orchid that grow in the open spaces around the vineyard parcels. A couple of them grow in our back yard as well, but I end up mowing them down (we did move one into a flower bed to get it out of the mower's path). The flowers are multiple on short stalks and the whole plant is usually no more than about six inches tall. A wild orchid flowering out toward the end of the vineyard road. In addition to this white one which is flowering right now, there are many purple varieties that flower a little earlier in the spring. I never knew that there were such things as wild orchids, let alone that they would grow in our climate (I thought all orchids were tropical). A naturalist friend of ours introduced us to them, and now we see them everywhere. After this I'll lay off the grape vines for a while. Or not. 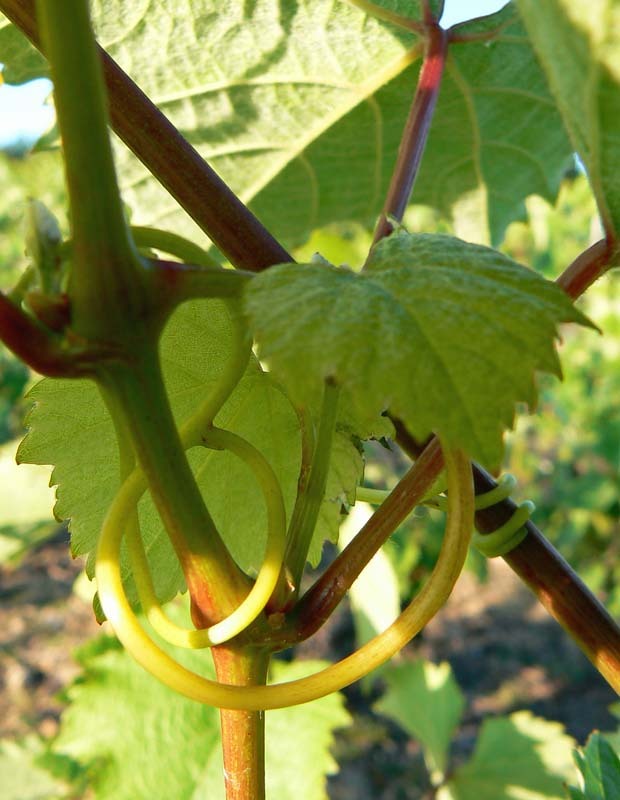 This is close-up of the vine tendrils as they search for and wrap around anything that can support them. Some of the curly-cues can get quite elaborate. As a testament to their strength, the hardened woody tendrils are often left wrapped around the guide wires after the vines are pruned away in the fall and winter. Vine tendrils wrapping around the vine stems. This morning was a bit chilly. Clear skies overnight again. I had my t-shirt, a sweatshirt, and a fleece on for this morning's walk. There's only a slight breeze, so it didn't feel too cold and the rising sun warmed things up nicely. I turned the sprinkler on the vegetable garden to give it a good soak. It's still dry as a bone out there. But the plants are growing. The corn is as high as a hedgehog's eye. And the lima beans are sprouting.